Will Dixon Hawke's wiley wisdom be enough to allow him to penetrate Hitler's inner sanctum and destroy the secret weapon created by Nazi scientist Dr. Krantz or will he be found out as a British Spy? The wind howling over the wild moorland drove the rain in a blinding deluge against the windscreen of the big, black saloon, and the driver, crouched over the wheel, swore beneath his breath. Every now and then he slipped a duster from the dashboard pocket and wiped the glass as it steamed up. By which remark Herr Gustav Stonberg revealed his utter lack of any sense of humour, for, as one of the leading members of the German Secret Police, the dreaded Gestapo, he had been responsible for building some of the worst concentration camps in Germany. Cursing viciously to himself, he sent the car splashing through a swollen stream, throwing great sprays of water from either wing, and went bumping up the narrow road on the other side. But presently he slackened speed and gave the windscreen another wipe over. Peering ahead, he at last spotted the landmark for which he was searching, the chimney stack of a derelict mine shaft. Going cautiously now, he eased the car across the heather to the shelter of a pile of boulders, and shut off the engine. Two miles away, down in the valley, lay the camp where many naval and civilian German prisoners were interned, but not a glimmer of light was showing. Leaving the car, Herr Stonberg moved cautiously towards the ruins of the old boiler house, halting every few steps and listening, but the wind and the rain made too much noise for him to hear the whistle for which he was eagerly waiting. Suddenly a figure moved in the darkness, and Stonberg’s hand streaked to his breast pocket, and out flashed a small but deadly automatic. He stood perfectly still, ready to shoot to kill at the first sign of treachery or danger. Then he heard it, three queer notes whistled clearly and repeated at regular intervals. 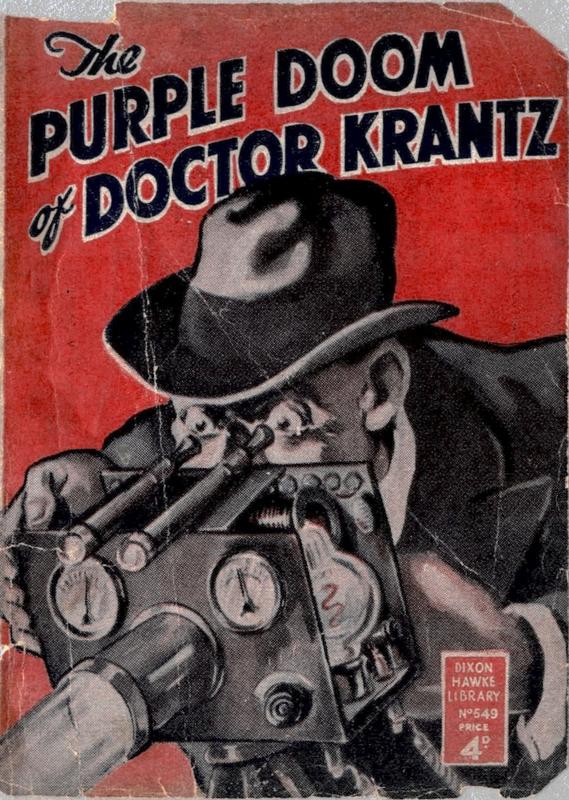 The story continues … buy it today and find out if Herr Doktor Krantz succeeds in his mission!